Looking for a natural way to restore health and shine to your hair? Easy! 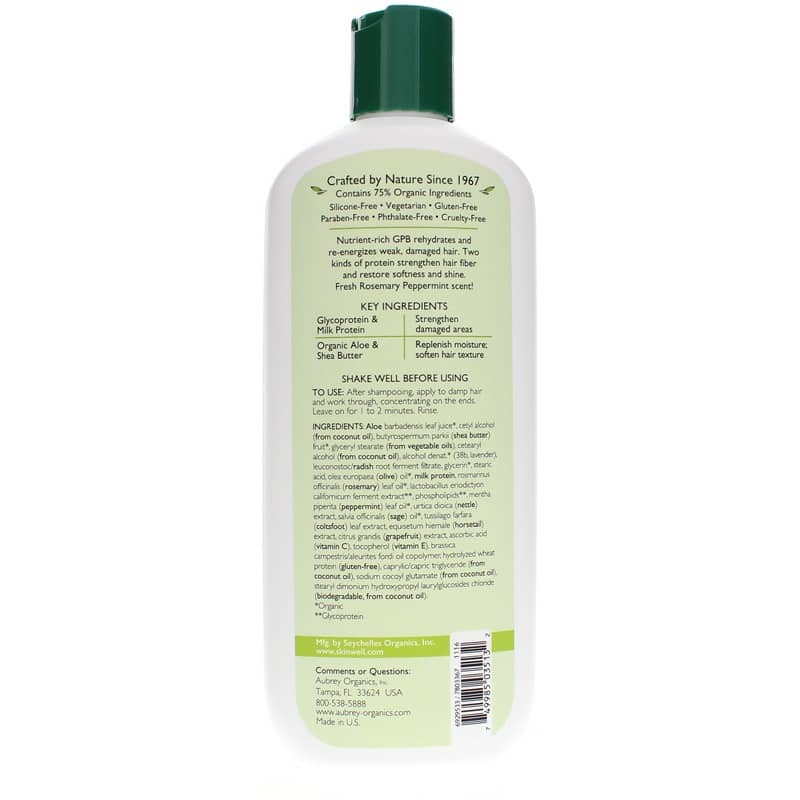 Give GPB Balancing Protein Conditioner from Aubrey Organics a try! Using all-natural ingredients and absolutely no harsh chemicals, this conditioner provides moisture and beauty in every application. GPB Balancing Protein Conditioner from Aubrey Organics comes in a biodegradable and recyclable container. It's cruelty-free and is never tested on animals. Give your hair a little extra love. Keep it strong, healthy, and moisturized while adding beauty and shine. 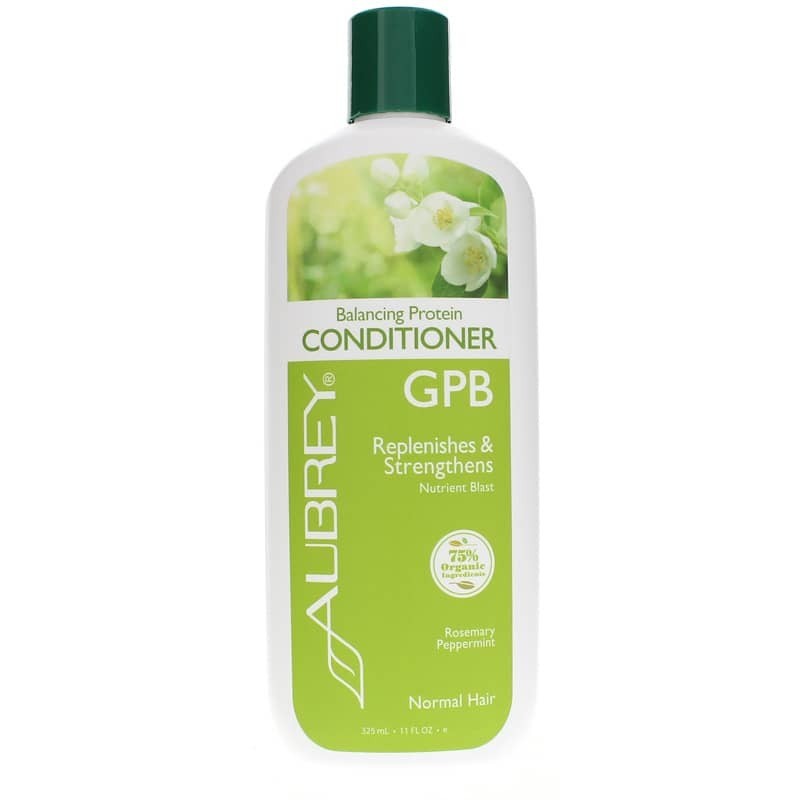 Try GPB Balancing Protein Conditioner from Aubrey Organics today! Aloe barbadensis leaf juice*, guyrospermum parkii (shea butter) fruit*, cetyl alcohol (from coconut oil), glyceryl stearate (from vegetable oils), cetearyl alcohol (from coconut oil), caprylic/capric triglyceride (from coconut oil), leuconostock/radish root ferment filtrate, alcohol denat. * (38b, lavender), glycerin*, milk protein, lactobacillus eriodictyon californicum ferment extract**, phospholipids**, stearic acid, tussilago farfara (coltsfoot) leaf extract, equisetum hiemale (horsetail) extract, urtica dioica (nettle) extract, salvia officinalis (sage) oil*, Rosmarinus officinalis (rosemary) leaf oil*, sodium cocoyl glutamate (from coconut oil), citrus grandis (grapefruit) extract, ascorbic acid (vitamin C), hydrolyzed wheat protein (gluten-free), stearyl dimonium hydroxypropyl laurylglucosides chloride (biodegradable, from coconut oil), natural fragrance***. I've used GPB Glycogen Protein Balancing Conditioner before so I already knew how luxurious it feels. I had to stop using it though because I had sisterlocks...I am now in the long, long, long and tedious process of combing them out (I refuse to cut them as I am not a "short-hair" type of woman). Thanks Aubrey O!! I saw the Giovanni balanced hydrating PH balanced shampoo was on sale when I needed the Clinical Essentials multi-vitamin,by Terry Naturally ( which I can't be without ). Would definitely reccommend. I used to use Aubrey GPB Conditioner exclusively for my long hair--it was the only thing that kept it manageable! But Aubrey was bought by Washington Partners in 2016, and they took it off the market for nearly a year to "reformulate" it. I was dismayed that they would change the formulation of a perfect product, but nonetheless was the first to buy it when it became available.<br><br>I purchased two flavors of the conditioner, Rosemary & Peppermint, and Vanilla Balsam. After a month, the Rosemary & Peppermint started to smell weird, like sour milk, and eventually I had to stop using it, even there was about a third of the bottle left, because it made my hair smell terrible. The expiration on the bottle is 05/2019.<br><br>I switched to the Vanilla Balsam. This one was fine in terms of smell, and likewise conditions okay (but not as well as the original product), but has little wax-like balls in it that I find distracting, like you'd find in exfoliating scrubs.<br><br>I called Aubrey 8-30-17 to ask them if it needed to be kept in the fridge between washings, and the customer service rep said, "No." When I told her about the sour milk smell, and even told her I had to stop using it, she said that was normal. I asked her if the wax-like beads in the Vanilla Balsam were "normal" and she answered, "Yes" and seemed unconcerned about the degradation in the product. I told her that I would be buying a different brand in the future (which I discovered in the intervening year that this was unavailable) and she was cordial in agreeing that would be best.